The Confiderm CL Latex Exam Gloves Powder Free - NonSterile are gloves made with latex-based material. This can cause allergic reactions to patients or caregivers who are sensitive to latex products. 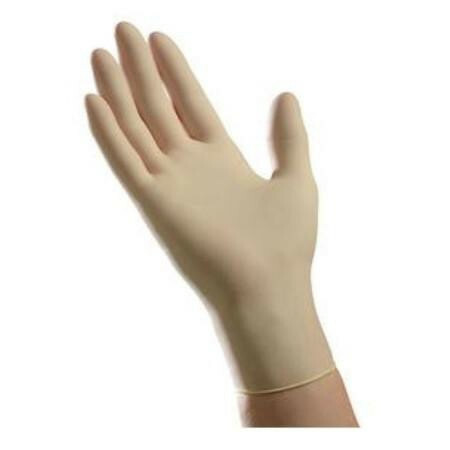 The gloves are powder-free, this powder helps the hand easily enter into the glove but can leave your hands full of white powdery residue; if you would much rather have a glove that is easier to put on when hands maybe moist then you may want to consider an option such as the Ambitex Powdered Latex Gloves. The gloves have textured fingertips, this improves grasp and holding onto items and objects, preventing slipping and accidental spills - even when gloves are wet or object are slippery. The beaded cuff of the glove prevents the end from rolling up, this annoyance can have consequences when exposed to hazardous materials. The gloves are office grade and can be used in a healthcare facility. The exam gloves are not meant to be used for handling or administrating chemotherapy medications as these are not chemo-rated latex gloves. These medications can cause health concerns if it happens to come in contact with skin. For added protection, the gloves are measured at 9.4 inches in length. This helps extend the protection point past your wrist and can be used for either hand as it is made ambidextrous. The exam gloves are not meant to be used for surgical procedures, they are non-sterile and meant for normal everyday use. If you are looking for an exam glove free of latex material, you may be interested in the McKesson Vinyl Exam Gloves. Vitality Medical always delivers supplies in a timely fashion. I am constantly adding to my orders and finding everything I need with vitality. I have purchased this brand numerous times and then all of a sudden the last 2 cases I ordered the gloves are thin and tear easily. Guess I will be searching out a new brand.